With this printable activity, kids practice vocabulary and the Spanish vowel sounds. The Spanish clothing vocabulary on the printable is introduced in the video Spanish Words Kids Love: La Ropa. Watching the video, kids hear the words pronounced correctly. The second half of the video has a question-answer format. In this segment, kids hear the words again and practice saying them aloud as they answer questions about what the woman is wearing. Watching the video is a good way to prepare to do the printable activity. Download the Spanish clothing vocabulary practice. 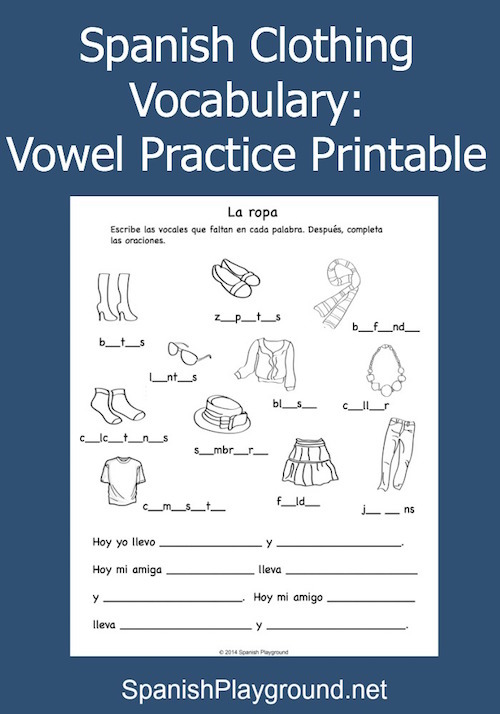 For this complete-the-word activity with Spanish clothing vocabulary, kids pronounce the words aloud to determine the vowels that they need to add. This is an important writing skill to develop. It also makes kids aware of the vowel sounds in words. Vowel sounds are essential for correct pronunciation. After they complete the words, kids use the Spanish clothing vocabulary to write a sentence about what they are wearing: Hoy yo llevo jeans y una blusa. They also write two sentences about what friends, one boy and one girl, are wearing. The sentences about their friends include a blank to write the friend’s name: Hoy mi amigo Andrés lleva calcetines y zapatos. You can find more videos and printables on the Spanish Playground Pinterest boards. Hola, esto es grandioso, pero no se como puedo imprimirlo? If you click on the link that says “Download the Spanish clothing vocabulary practice” it will open the image in a separate window. Right click and choose “save image as.” (it will probably save it in downloads). Then you can open it and print it.